Looks like it’s time to take a look at the original sequel to Frankenstein. I did not like the first film and I’m not a Frankenstein fan in general. I didn’t walk into this film with high expectations and I was not disappointed. That being said, it is a considerable improvement over the first film. It’s not nearly as violent or grotesque and handles itself rather maturely this time around. It can still be a bit of a tragic film at times even when it tries to be funny so it can be hard to tell when you’re supposed to be laughing or feeling sorry for the characters. I usually voted for the former. The film starts off in the “real” world as Mary lets everyone know that the story isn’t over yet. We have some really over the top actors who yell about this and everyone gets excited so she tells them what happened. It turns out that Frankenstein’s monster didn’t die because he fell into the river and Frankenstein didn’t die because his body is very durable. This prompts Doctor Pretorius to arrive and tell Frankenstein that he wants to make a female version of the monster. Frankenstein halfheartedly refuses so Pretorius kidnaps his wife. Frankenstein now has to work against time in order to save her, but can he really duplicate the experiment? The main improvements from the first film all stem from the reduced violence. The first film had a little kid drowned and we saw way too much brains and body parts for my liking. It was pretty distasteful and this one steers clear of all that. Even when they’re creating the bride, it’s never graphic. The film just isn’t violent in general and the victims are far fewer in number. We do have a few people die of course, but they’re casually thrown aside for the most part so it isn’t all that bad. Frankenstein has changed a lot since the first film. He’s now incredibly timid and fears everyone. He’s always getting picked on and forced into doing things that he doesn’t want to do. However, he reverts back to his mad scientist phase whenever there is work to be done and it’s like he never changed at all. It would have been nice to have seen him have a little more will power. Naturally, he did have to go ahead with the project to save his wife, but he could have done it in a sane way instead of losing his mind once he was back in the lab. Pretorius takes over Frankenstein’s role from the first film and I do certainly have to admit that he is smart. The first thing he does is to get the monster on his side and that was crucial since his plan would not have worked otherwise. His use of “Miller Time” and Cigars was a very potent combo. He always has the upper hand on the monster as he even drugs the poor guy later on. Pretorius fears nothing and is just very confident from start to finish. He was a pretty good villain and while it never felt as if he had much of a reason to do what he was doing…do mad scientists ever need a reason to do something? They just do whatever they want for kicks. Minnie is the main comic relief character of the film and she does a good job in the role. She always talks a good game and is one of the only characters to insult Pretorius to his face. She is smart enough to actually run away from the monster and tries to warn the heroes even if they refused to listen to her. She certainly did a fine job if you ask me. As for the Bride, I guess she was fairly reasonable. Her reaction wasn’t all that bad when you consider that the heroes didn’t give her a chance to relax. Plus, who wants to be thrown into an arranged marriage the instant you are born into existence? Nah, the first thing you’d want to do is get out of there! The Monster is all right I suppose, but he’s still not very smart and the monster noises can be annoying. I was glad that he finally learned how to talk a bit as the film went on. I figure that will make him a much better character in the sequels although it seems like I wasn’t on the same page as the writers. At least the monster tried to live a calm life at one point and was doing just fine with the blind guy in the hut. It’s a shame that the hunters had to wander in at that point and wrecked his one chance at a happy ending. He didn’t get burned this time and while he was captured at one point, he was able to break free pretty quickly. He certainly had a much more enjoyable adventure this time around. Be warned that the title of this film is pure click bait. The Bride doesn’t appear until the final 5-10 minutes which is pretty disgraceful. She only gets roughly one line before the film has to end so if you were watching the movie to see her in action, prepare to be disappointed. It’s really just Frankenstein V2 as the film takes a lot of similar twists and turns. It seemed like it was meant to be a homage to the original in a lot of ways even though it had just come out. It was just handled far better than the first film and as a result, the film wasn’t half bad. I can’t say that it’s the kind of film that I’d want to watch again, but it wasn’t a chore to watch the way that I would have expected it to be. Overall, If you’re looking for a horror comedy film, then this could be the right film for you. At the very least, it’s one of the best Frankenstein films that you can hope to see. That being said, it’s still not all that great and it’s short length ensures that the film has to run through the plot. The ending is pretty satisfying though and that’s always a good thing for these kind of films. Scooby Doo may still be your best bet when it comes to horror comedies, but this one gives it its best. Can the third film manage to defeat this one? I somehow doubt it, but we are getting closer to the Werewolf and that could certainly end up being another story. This entry was posted in Live Action Movie Reviews, Live Action Movies, Reviews and tagged Bride of Frankenstein, Creature Feature, Film, Film Review, Frankenstein, Horror, Movie Review, Retro, Review, Sequel, Universal, Universal Monsters, Universal Pictures by dreager1. Bookmark the permalink. 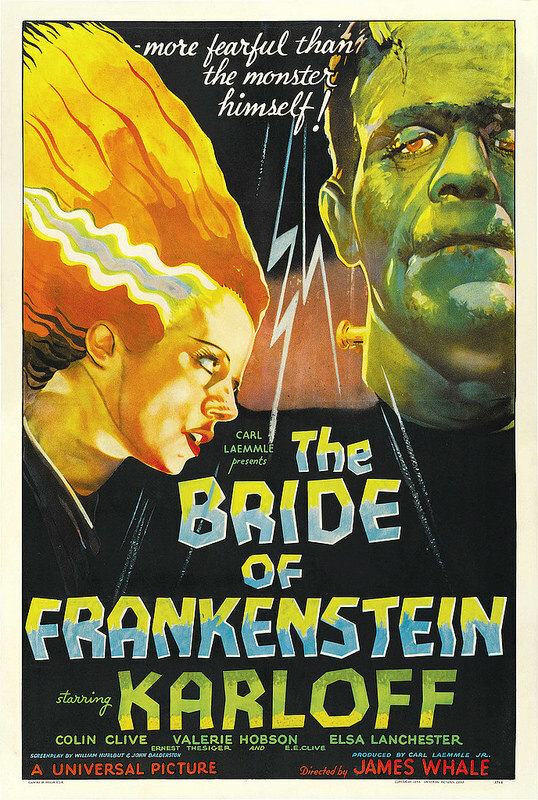 Bride of Frankenstein is one of my fave Universal Horror Films! Its a classic, dated now for sure, but I love the dark gothic tone and look. Without doubt the bets Frankenstein film imop. 2016 was definitely a really sad year with all of those deaths. That’s actually how I got to watch all of those Gene Wilder movies as some stations were playing marathons of his best hits. Well, Pryor and Wilder definitely had a good run and I hope that they were able to pass away knowing that they left a real mark on the world.